1904: The first Shelsley Walsh speed hillclimb event in Worcestershire was won by British driver Ernest Instone, who established the hill record by posting a time of 77.6 seconds for an average speed of 26.15 mph in his 35-bhp Daimler. The course was 992 yards in length, but in 1907 it was standardised at 1,000 yards, the length it remains today. 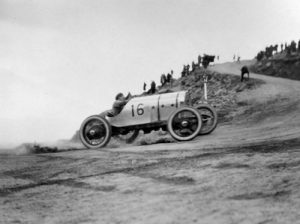 1916: (10-12th) The first Pike’s Peak hillclimb contest in the Rocky Mountains was held, to celebrate the completion of a new road built by Spencer Penrose, who presented a 60-lb silver trophy. It was won by Rea Lentz with a Romano Eight, which climbed in 20 minutes 55.6 seconds. The event is named after Lt Zebulon Pike who was commissioned by President Jefferson to carry out a survey in July 1806, but eventually abandoned as ‘utterly impossible’ his attempt to scale the 14,110 ft mountain. 1939: The Vintage Sports Car Club held the last auto race at Donington Park, in England, before the outbreak of World War II. 1951: Newcomer Tommy Thompson outlasted Curtis Turner in an epic slugfest to win the Motor City 250 at Detroit, US. 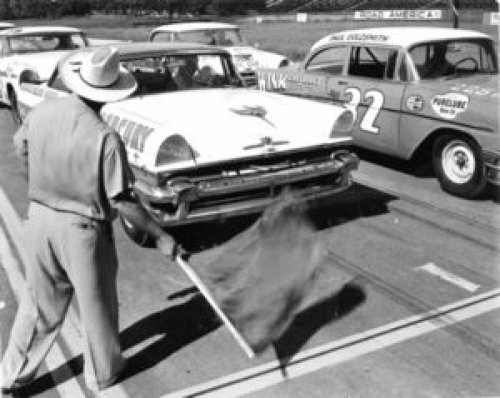 Driving a Chrysler, Thompson survived a motorized rubdown with roughneck Turner, taking the lead with 18 laps remaining, and collecting $5,000 for the victory. 1956: Tim Flock kept a steady pace to score the last of his 39 career victories in the only race for NASCAR’s top series at Road America in Elkhart Lake, Wisconsin, US. Flock led 17 of the 63 laps on the 4.1-mile road course, finishing 17 seconds ahead of Billy Myers in a 1-2 finish by Bill Stroppe-owned Mercuries. Fireball Roberts took third place. 1969: Mark Donohue drove a Chevrolet Camaro to victory in the SCCA Trans-Am race at Watkins Glen, New York, US. 1979: Alan Jones won the Austrian Grand Prix for Williams, with Jaques Villeneuve (Ferrari) second and Jacques Laffite third (Ligier). 1985: Manfred Winkelhock (33), was killed when he crashed heavily at turn 2 at Mosport Park of Bowmanville near Toronto, Ontario, Canada, during the Budweiser 1000 km World Endurance Championship event. He was driving a Porsche 962C for Kremer Racing with co-driver Marc Surer. 1990: Belgian driver Thierry Boutsen driving a Williams FW13B took his third and final Grand Prix win in Hungary after leading the entire race. Italian driver Alessandro Nannini driving a Benetton B190 challenged for a while, before being eliminated in a collision with Brazilian driver Ayrton Senna. Senna, driving a McLaren MP4/5B survived the incident and finished inches behind Boutsen with Brazilian three time world champion Nelson Piquet driving a Benetton B190 finishing third. 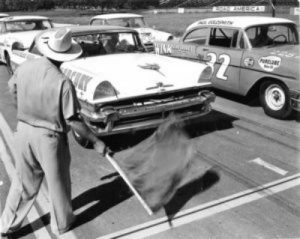 1950: Twenty-one-year-old Fireball Roberts drove his Oldsmobile to victory in the 100-mile NASCAR Grand National event at Occoneechee Speedway in Hillsboro, North Carolina, US, making him NASCAR’s youngest winner. Darlington Raceway officials announced that the inaugural Southern Five-Hundred field would be expanded from 45 to 75 cars. 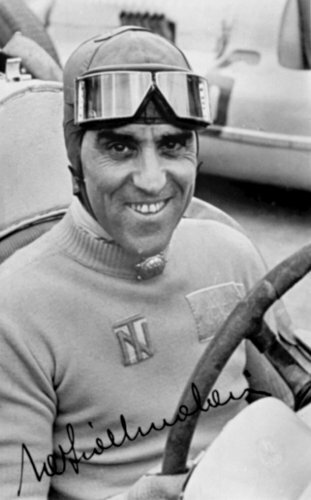 1953: Pre-World War II racing legend Tazio Nuvolari was buried in Mantua, Italy, in his yellow shirt and leather helmet he wore while racing. His pall bearers were Alberto Ascari, Pietro Ghersi, Gigi Velloresi, Juan Fangio, Giovanni Bracco, Gino Valenzano, Renzo Castagneto, Umberto Maglioli, and Learco Guerra . 1972: Emerson Fittipaldi won the Austrian Grand Prix for Lotus, leading home the McLarens of Denny Hulme and Peter Revson. 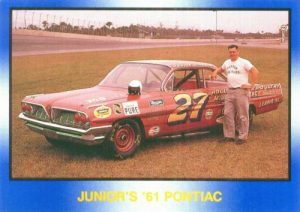 1977: Racer Bobby Isaac (45) died of a heart attack caused by heat exhaustion suffered while driving in a NASCAR Late Model Sportsman event at Hickory, North Carolina. 1978: Ronnie Peterson took his 10th and ultimately final Grand Prix victory, winning in Austria for Lotus. 1989: Famed French Grand Prix driver and restaurateur, Rene Dreyfus (87), who raced automobiles for 14 years in the 1920s and 1930s, the Golden Era of Grand Prix motor racing, died from a heart attack. 1989: Nigel Mansell stormed through from 12th on the grid to win the Hungarian Grand Prix for Ferrari. The race is best remembered for Mansell’s marvellous overtaking manoeuvre on Ayrton Senna as the two came upon a back-marker at the same time. 1995: Damon Hill led home David Coulthard in a British and Williams 1-2 at the Hungarian Grand Prix. 2001: The Hungarian Grand Prix saw Michael Schumacher win his fourth World Championship and equal Alain Prost’s record of 51 Grand Prix victories. Rubens Barrichello in the other Ferrari finished second and McLaren driver David Coulthard finished third. 2006: Around 25,000 people lined the streets of Manchester in the UK as six A1GP race cars roared around the city centre, reaching speeds of up to 170mph. A1 Teams Australia, China, Great Britain, Ireland, Lebanon and Malaysia thrilled the crowds along a purpose built 1.5km course as part of it’s broadcast partner’s Sky Festival.